A father of 4 and I absolutely adore, appreciate and am inspired by each of my kids. Self-employed, backcountry geek turned web and marketing guru who would trade any day of the week for a couple hours in the mountains. My interests are vast, passions many and I live to understand the depths of my being with how it balances in the world. On May 1, 1963 Jim Whitaker became the first American to summit Mt. Everest along with Sherpa Nawang Gombu by the South Col route that’s popular today. Three weeks later a Tom Hornbein and Willi Unsoeld, who were from the same expedition as Whitaker, began a stunning assault on Everest’s then unclimbed West Ridge. They reached the summit by the West Ridge on May 22nd – still today one of the greatest feats in mountaineering history. Of course every professional mountaineering expedition has sponsors to offset the costs. 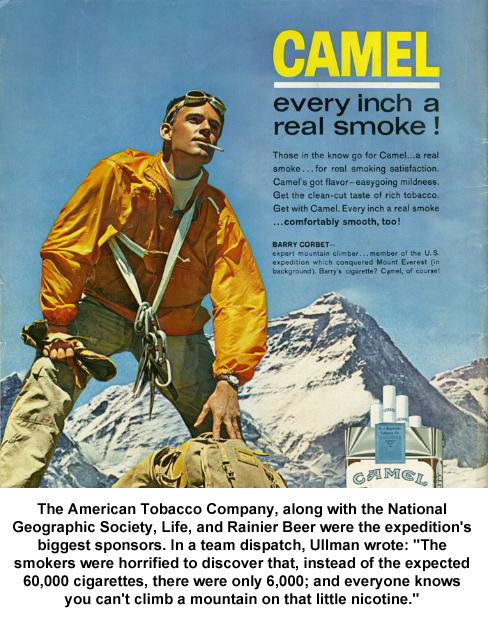 With the ’63 American expedition to Everest Camel cigarettes was one of the sponsors. My favorite quote (@ 2:22): “Facebook is integrated right into iOS 6. So get ready to read more sh*t you don’t care about.” Made me laugh out loud. So true, so true. They call him ‘Tennis’ Greatest Entertainer.’ His name is Mansour Bahrami. He does some amazing tricks. And while some of this is surely staged, he also appears to be a pretty good tennis player as well – having reached the 1989 French Open Doubles Finals. His reverse serve is great. As are the impressions of Becker and McEnroe. And you gotta love the slow motion mimic. Really funny. Love to see him live. More is caught than taught.